The first products were simple GPS receivers, such as those introduced by Magellan in the late 1980s, that generated coordinates (latitude, longitude, altitude) for waypoint navigation plotted on a blank screen. In the early 1990s, Magellan and competitors such as GARMIN International and Lowrance added digital mapbases to receivers that provided a real-world sense of a user’s location. Because of the widespread use of cars, from the mid-1990s automotive aftermarket navigation systems were long expected to become a popular consumer item, but high prices constrained the growth of this sector. Factory-installed GNSS receivers are now expected to be standard in almost all vehicles by 2009. In the meantime, however, personal navigation devices (PNDs) that featured powerful processing power, substantial memory, colorful graphical user interfaces (GUIs), and frequently wireless communications became increasingly popular. For instance, TomTom sold 4,687,000 personal navigation devices in 2006, nearly 20 times the amount they sold only two years earlier. More recently, cell phones have emerged as a rival GNSS platform to PNDs, driven in large part by an initiative of the U.S. Federal Communications Commission (FCC) required “enhanced 911” capabilities for mobile handsets: the ability to accurately and automatically locate emergency calls made from mobile phones. Today, telecom service providers — such as Verizon Wireless with its VZ Navigator — are offering handsets with optional turn-by-turn, voice-guided navigation systems that rival the functionality of much more expensive in-car systems. Nokia has an installed base of more than 900 million mobile phones, reputedly the world’s largest. All of these navigation system platforms require accurate, navigation-quality mapbases that incorporate up-to-date information on streets and highways worldwide — not merely the road network itself, but such additional features as turn restrictions, speed limits, construction zones, and so forth. The popular on-line mapping service MapQuest, for instance, uses databases from both NAVTEQ and Tele Atlas. The ArcIMS Route Server from ESRI, the leading geographic information system (GIS) software provider, can use commercial datasets from NAVTEQ and Tele Atlas as well as other digital map providers. LBS service providers also license the navigable mapbases and populate them with value-added points of interest (POI) data. NAVTEQ and Tele Atlas are the only two companies offering such map data bases with global reach, which imbues the prospect of their acquisition by the leading PND and mobile phone manufacturers with particular significance. It also effectively corners the market on a key technology that many other companies require for their products and services, including numerous competitors of TomTom and Nokia. TomTom started the ball rolling with a July 23 offer to purchase Tele Atlas stock for €21.25 (US$30.03) per share, an offer that would amount to $2.6 billion in value. TomTom has seen its stock price more than double this year on the Nasdaq exchange, from less than $40 per share in April to more than $80 in late September. About have of that increased occurred since the proposed purchase of Tele Atlas. On October 1, however, Espoo, Finland–based Nokia and NAVTEQ, headquartered in Chicago, Illinois USA, announced that the two companies’ boards of directors had approved a definitive agreement for Nokia to acquire NAVTEQ for $78 (€55.11) per share. The cash purchase, including outstanding options, amounts to an aggregate purchase price of approximately $8.1 billion (€5.7 billion), or approximately $7.7 billion (€5.4 billion) net of NAVTEQ’s existing cash balance. The price represents a 129 percent premium to the company’s share price of $34.05 six months ago. Under the purchase/merger plan, NAVTEQ’s current map data business will become a wholly owned subsidiary of Nokia, and Navteq CEO Judson Green will report directly to Nokia CEO Olli-Pekka Kallasvuo. TomTom plans a similar disposition for Tele Atlas. 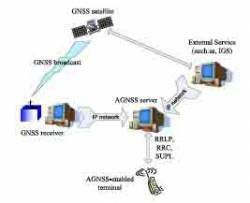 The company has also been very active in standards-setting for positioning and location services, including a proposal for network-assisted techniques (AGNSS) that would incorporate signals from all GNSS services, not just GPS. If all goes well, Nokia expects to complete its acquisition of NAVTEQ in the first quarter of 2008. The day after the Nokkia/Navteq announcement, TomTom and Tele Atlas jointly announced an acceptance period for purchase of outstanding common stock of Tele Atlas would last from October 3 to December 4, 2007. The factors in play and stakes are enormous. Nokkia had 2006 net sales of €41.1 billion (US$58.2 billion) and €4.3 billion (US$6.08 billion) in profit. More than half of its 2006 revenues — €24.8 billion — came from sales of mobile phones. China was its biggest market that year with sales of €4.91 billion (US$6.95 billion). Chicago-based NAVTEQ, founded in 1985, has approximately 3,000 employees located in 168 offices in 30 countries and generated 2006 revenues of $582 million and income of $109.46 million. The company was originally incorporated in August 1985 as Karlin & Collins, Inc., and reincorporated in September 1987 as Navigation Technologies Corporation. In February 2004, the company changed its name to NAVTEQ. At TomTom, PNDs represented 93 percent of the company’s 2006 revenue: €1.36 billion (US$1.92 billion) with €222 million (US$314 million) net profit. Revenue reached €380 million in the second quarter of 2007, with €68.3 million net profit. That prosperity is a relatively recent development. The company generated only €8 million revenue in 2002. Ninety percent of TomTom’s business is in Europe. Founded in 1997 as Palmtop by a couple of recent Amsterdam University graduates seeking to produce handheld computers, the company was renamed in 2001 when the company launched its first TomTom Navigator in-car navigation system. Chief Executive Officer is Harold Goddijn, former CEO of Psion, joined the company in 2001. Founded in 1984 and headquartered in Gent, Belgium, Tele Atlas provides maps covering 64 countries around the world and uses a network of professional drivers, mobile mapping vans, and more than 50,000 data resources to deliver accurate, up-to-date digital maps. In 2000, the company acquired ETAK, a U.S. publisher of digital maps and location-based technology for in-car applications. Tele Atlas’s revenue in 2006 was €264.3 million (approximately US$349 million) when the company shipped 7.8+ million maps for personal navigation and other applications. Tele Atlas has approximately 2,400 full-time staff and contract cartographers in offices worldwide. Reflecting their geographical origins, NAVTEQ is somewhat stronger in the United States; Tele Atlas in Russia, China, and other international markets. Both compete strongly for the European audience. Although all the companies involved in the proposed mergers insist that they will continue to offer their map data to existing and new customers, including competitors to Nokia and TomTom, companies with interests in the geospatial and location application markets — such as GARMIN International, Microsoft, and Google — are reportedly watching and evaluating the deals closely. That could result in other companies bidding for Tele Atlas or even both TomTom and Tele Atlas. Nokia, on the other hand, has nailed down its bid more tightly. According to filings with the U.S. Securities Exchange Commisson (SEC), the agreement includes a $250 million termination fee that would go to Nokia, and NAVTEQ may not solicit competing bids or hold discussions with potential rival bidders.